Question: How many sessions will my dog need? Answer: It depends on the amount of training required and the owners previous training experience. Some basic training can be solved in just one session whereas long term problems and more advanced training will take multiple sessions. 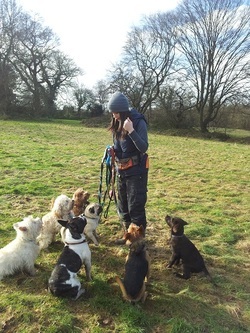 Your trainer may provide a training advice sheet to help owners remember multiple points discussed during training sessions and 'homework' for both dog and owner to practice. Question: Where does training take place? Answer: We will usually come to you. This could be at your home or local park. The location depends on the training required e.g. it's hard to help toilet train a dog in your home if we only train in the park. Question: My dog has food allergies / is not interested in treats. Can you still work with us? Answer: Yes. We have worked with many dogs that are not interested or simply cannot have food rewards with very successful results. Some dogs will alternatively work for a special toy or simply a bit of fuss. We have also worked with deaf, blind and disabled dogs. Question: Do I need to bring anything? 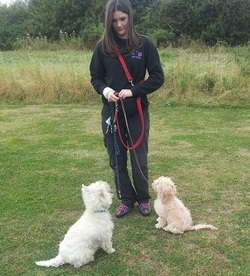 Answer: All that is required for training is your usual dog walking equipment (collar, lead, harness etc). It is a good idea to have some of your dogs favourite treats or a special toy at hand. Rewards, training equipment and supplies are available from your trainer. Question: How old must my puppy be before training starts? Answer: Training puppies can never start too soon once you get them home. Until a week after their 2nd injection it is not recommended that you take them out for walks. Our private home training sessions mean that we can come to you and training can begin before your puppy has their vaccinations. It is usually best to give new puppies a few days to settle into their new home first. Question: I'd like to take part in a group class. Do you run them? Answer: We specialise in private training and do not have premises for group classes. However we do have stooge dogs who we can use during sessions. 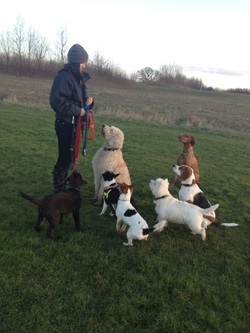 We can direct you to a local dog training club on request.